Its been almost 48 hours, from the time Terror striked Mumbai yet another time. 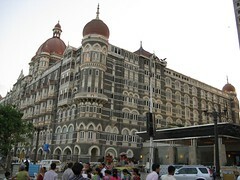 National Security Guard(NSG) along with the support of Marine Commanders (MarCos) and Rapid Action Force(RAF), atlast accomplished the operations at Oberai Hotel and Nariman house, but sources say that there are still few terrorits inside Taj Hotel and we might need to wait till dawn for the final end of assault. Few of our top post brave officers died while they were engaging terrorists outside Cama Hospital viz. Ashok Kamte (Additional Commissioner), Hemant Karkare (Anti Terrorist Squad Chief) and Vijay Salaskar (Inpector, especially known as encounter specialist). You can know more about it from Mayur Shah's site and also you can pay tribute to them by contributing your views on a section Tribute to Bravehearts. 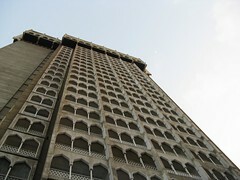 Mumbai yet again saw one more face of Terrorism. Mumbai once again is in threat. Its not a new thing for us Mumbaikar's. This time terrorism went to another dimension and another level. But should we make up a habit to leave with it. It's not that we ain't fighting it, but then this is a time we need to fight with more rage and strength and bring it in some control. We try so hard with the true spirit of Mumbai, that we don't budge with incidents which sometime can bring the whole country to stand still. But even after fighting every time these terrorists come back and harm us more. This events should not be left alone to Government or security forces, but its for all of us Mumbaikars to give a serious thought. We need to bring some kind of control over things. Anyways, hope every morning I wake up, I feel safe and can breathe the fresh air through out my life. And I know there is something or other I can do to make sure that dream come true. 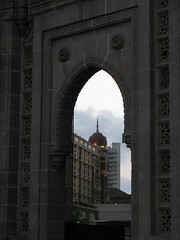 Gateway of INDIA, TAJ Hotel (both old and new) are one of the prestigious tourist attraction in Mumbai, which we visit on a regular basis. The wonderful place is today blazing in fire and being damaged by hand grenades and bullet firings. We want to continue to go there and have a great time again and again and again. Today you can check out the pictures of these places in news channel and see it burning, but I hope and Wish that we could share some beautiful picture of it in near future again. These are some of the pics which me and my friends clicked few months back.